Existing ads for food and drink which are considered high in fat, salt or sugar (HFSS) will be phased out from today (those which are already up won't be removed for a short grace period). But is this ban a positive step towards tackling obesity in the UK, or just a populist leap in the dark? The ban is remarkable given that the benefits of this kind of ban on advertising (which covers ads aimed at adults as well as children), are largely unknown. It also remains to be seen how this will impact the revenue derived from advertising on TfL real-estate, given that so much of it comes from these ads. We wonder whether TfL will soon take a kind of approach adopted in France, which would lead to banning ads for any kind of product (from insurance to holidays) which show someone sipping from an unidentifiable fizzy cola, enjoying a plate of pasta with friends, or having a biscuit with their tea - shock horror! Smart London hotels wanting to promote afternoon tea can forget it, and most restaurants will be left wondering whether they can promote their dishes on TfL real-estate. Salad and sparkling water anyone? But will the Mayor put his money where a commuter's mouth is by banning the sale of unhealthy food, drinks and sweets at every tube, coach and train station in London too...? 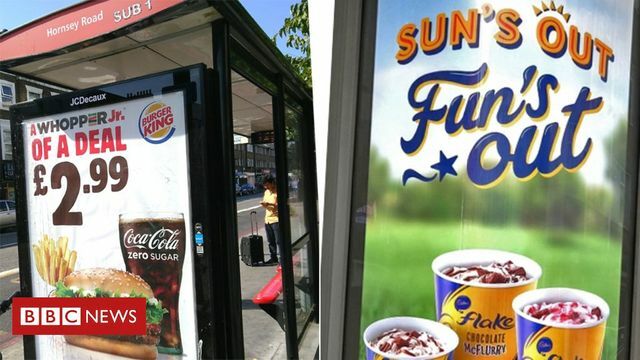 Another @SadiqKhan pledge comes into force today, banning junk food ads on our transport network.